Day four of the 2013 Australian Moth Championship, was used for catching up on races after Tuesday was cancelled. Racing got underway in a gusty 10-14 knot easterly which tended to have constant swings of five to ten degrees. The sailors were again a little too keen at the first start resulting in a general recall, however they all got away cleanly in the re-start. James Doran and Andrew 'A-Mac' McDougall seemed to have mastered running down the line on the course side and dipping back just as the gun goes to hit the line at full speed. 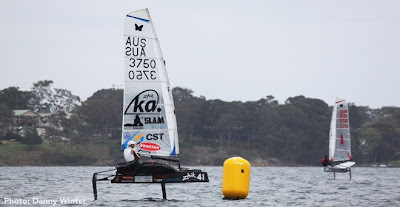 The Moth Squad boys still had their measure with Kiwi Peter Burling in first, followed by Joe Turner in second with Tom Slingsby third, Iain 'Goobs' Jensen in seventh and Nathan Outteridge in ninth. The second race of the day started in similar conditions, however this time it was Tom Slingsby’s turn to grab a win, followed by Josh McKnight, Burling and Jensen in fourth. The third race of the day saw Nathan Outteridge miss the start by nearly four minutes, after going to the shore for make shift repairs. He was never going to catch the leaders however he did catch quite a few boats and finished 23rd. Once again Burling dominated winning the race from Joe Turner, Scott Babbage and Dave Lister. With the forecast for Saturday looking very suspect, with very light shifty winds, and given the conditions were still quite reasonable, the race committee decided to run a fourth race, much to the dismay of many of the tired sailors. Once again Burling took control winning his third race for the day. He just looked so relaxed in his boat and had speed to burn. One person commented that he reminded him of the cartoon character Gumby when he tacked and gybed, slithering under the boom, but obviously it works for Burling. Second in the race was McKnight, followed by Iain 'Goobs' Jensen and Dave Lister. A notable retiree was Joe Turner, who did not wish to miss happy hour at the club. After 10 races, with two drops, Burling now leads on 10 points from Babbage on 21 points, McKnight on 29 points, Dave Lister on 32 points, Joe Turner on 37 points and Tom Slingsby on 44 points. Racing continues on Friday from 1:00pm.